If you’d like to order Polunnio publications online for delivery to UK addresses, you can do so here. If you’d like to order more than one copy of the books, for reseller enquiries, or for books to be sent overseas, please use the Contact form to send us a message. 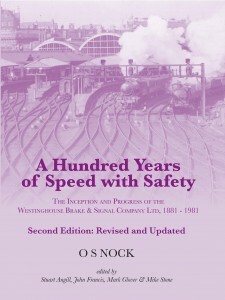 A Hundred Years of Speed with Safety, Second Edition Revised & Updated. OS Nock. Published 2014, 280mm x 210mm, 240pps, over 270 black and white photographs, stitch-bound, litho-printed. This is the new edition of the original book – the same authoritative text, but with over 70 additional photographs, additional sections including the early railway history of Chippenham written by Mike Stone, and a new, much larger format.